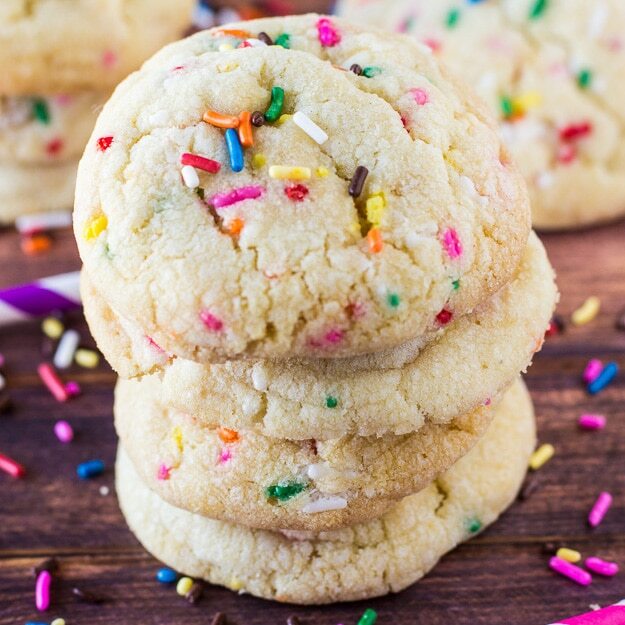 A soft, chewy, and puffy homemade Funfetti Sugar Cookies filled with SPRINKLES! I’m so excited to share with all of you my favorite sugar cookie recipe, it took me about 100 dozen tries (ok, maybe not that many) to finally get this sugar cookie recipe just right! 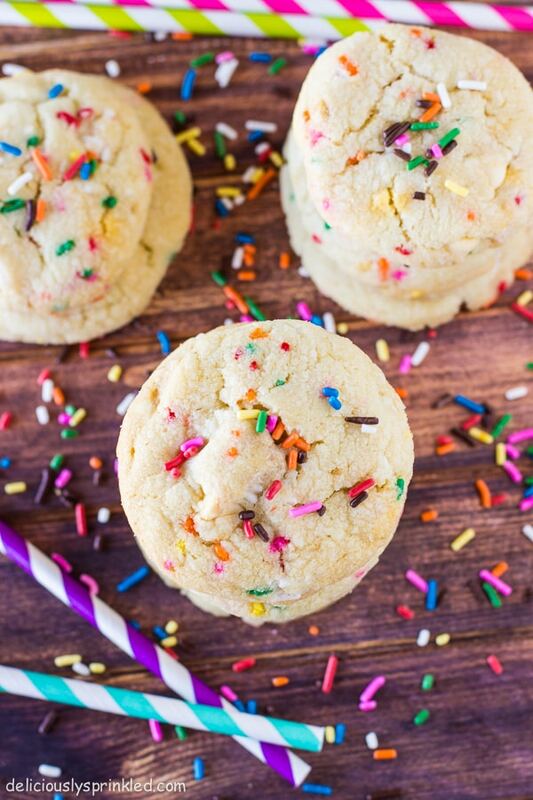 Imagine a soft, thick sugar cookie filled with fun rainbow SPRINKLES sprinkled throughout. That is exactly what these delicious sugar cookies are! You want to make sure that you use “jimmies” sprinkles in these cookies. They keep their vibrant colors once baked, unlike some of the other types of sprinkles I have tried. In a large bowl, cream together thoroughly butter, oil, powdered sugar and granulated sugar. Add eggs and vanilla and beat until smooth. Stir in flour, cream of tartar, baking soda, and salt until just combined. Do not OVERMIX the dough. Fold in sprinkles. Cover and refrigerate dough for at least 30 minutes, or overnight. This step is mandatory. Preheat oven to 350F degrees. Line two large cookie sheets with parchment paper or silicone baking mats. Scoop rounded tablespoons of the cold dough onto the prepared baking sheet. Make sure to keep dough chilled when working in batches. Bake for 10-12 minutes until edges are slightly browned. Allow the cookies to cool on the baking sheet for 2 minutes and transfer to a wire rack to cool completely. My kiddos would love this! Pinned! These look amazing Jenn! Super soft – just how I like sugar cookies! Love all the sprinkles 🙂 Pinned! These sugar cookies look amazing! Sprinkles rule! These look amazing! Love the idea of a funfetti cookie! These are so pretty! I absolutely LOVE funfetti! And I’m so intrigued by the use of oil and powdered sugar – must try! Your enthusiasm for sprinkles is infectious. I want to go home and add sprinkles to everything. Love these fluffy, rainbow flecked cookies. This really does look like fun and the whole page is so pretty. I pink puffy heart funfetti…and these cookies!! Gorgeous. There is something just so so fun about funfetti sugar cookies! These look perfect! Clearly worth all the tries to get them right! These just came out SO cute. How can you not love these happy cookies? These look fantastic! There is always an occasion for funfetti, in my opinion. I usually make rolled sugar cookies, but I need to give this drop cookie version a try. Thanks for sharing! Funfetti is my life. Cookies are my life. Especially thick and chewy cookies. 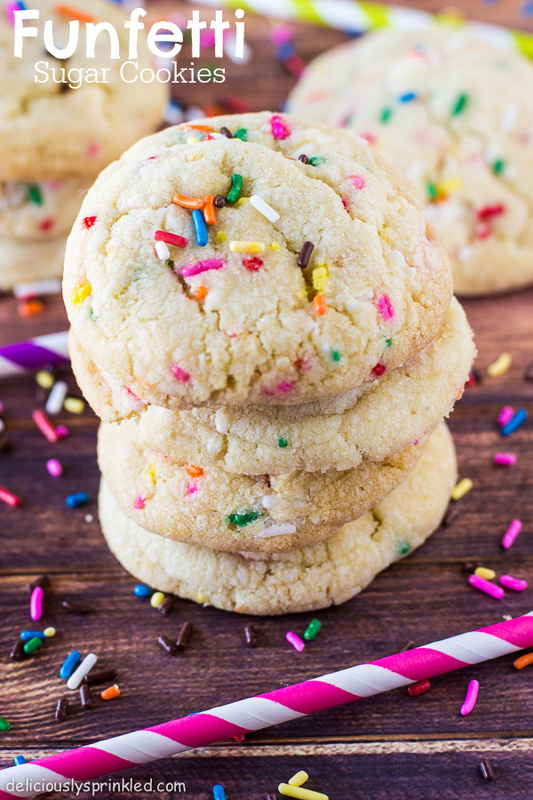 Is there anything better than a thick, soft sugar cookie stuffed with sprinkles? I think not! Pinned! I’ve been on the hunt for an amazing sugar cookie recipe lately…I have to try these! I’m sure they are tasty not to mention beautiful! Everything is better with sprinkles!